The first 12 weeks are vital in the development of a happy, healthy dog. Once your pup has been fully vaccinated, start taking it on short walks so it can meet other pups – and people. Children love puppies and will want to play with them, but too much at once can be overwhelming for your pup. Introduce children gently, one at a time, so it can gradually get used to being handled by different people. Your puppy needs to acclimatise to household noises such as the TV and vacuum cleaner, but start slowly. Some people use CDs featuring sounds such as fireworks and sirens, playing them quietly at first and increasing the volume over time. You are obviously going to want to take puppy for interesting walks, but it’s best to let them play in a stationary car a few times before embarking on short journeys. 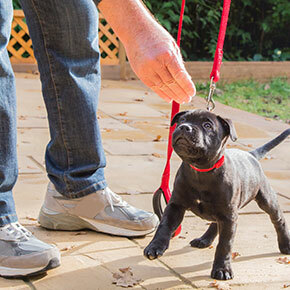 Build journey lengths gradually to get your puppy used to traffic and noise. Every time your puppy responds calmly to new situations, reward it with a treat. This sort of positive reinforcement encourages good behaviour in young dogs.